Custom Vinyl Banners are versatile, affordable and reusable. Ideal for trade shows, grand openings and special events. 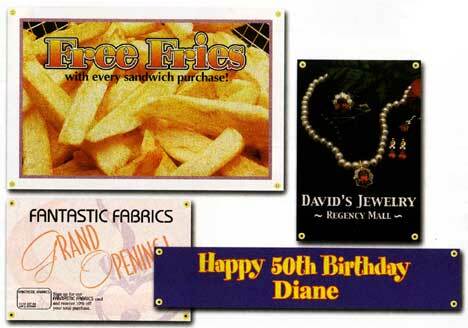 Durable vinyl banners have a double folded, double stitched hem and include grommets. Custom banners are printed digitally in full color. Custom vinyl banners are available in many sizes and unlimited colors. Suitable for indoor or outdoor use, our banners are a colorful way to promote your message at special events or for grabbing attention for your promotional message. For larger quantities, additional banner sizes, or for information on something you do not see here, please contact us. FREE Professional Design Services - If you don't have a design our graphic design team can create a design from your specifications. We will email your custom banner proof to you to review and our design servcies are free of charge. To request additional information on custom vinyl banners or to request a proof contact us . If emailing artwork send to elitedesignweb@cox.net. Quantity discounts available.